Europa Casino is one of the most popular online casinos in Europe. EuropaCasino currently uses the Playtech casino software which allows casino players to pick from hundreds of casino games. Europa caters to players across the world and allows players to play real money casino games with euros, pounds or dollars. Europa Casino has a variety of language options including: Italian, dutch, german and more! If you are depositing for the first time at Europa Casino you will be eligible to receive 2400 (pounds, dollars or euros) over the course of a year. Every month you will get 100% deposit bonus up to 100 ($/£/€) on the first deposit of the month. Do you want to be a Europa Casino highroller and receive special benefits? You can enroll in the Europa VIP membership by making a first deposit of 1000 ($/£/€) and you will automatically get 500 ($/£/€) in free bonus money and part of the exclusive club. As I said before, Europa has over 100 casino games. They offer players a variety of fruit machines “slot machines” including progressive, bonus and classic slots. There are table games including blackjack, three card poker, caribbean stud to name a few. Europa also has video poker, baccarat, craps and even Asian casino games (Sic Bo, Mahjong and Pachinko). 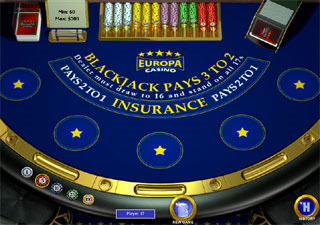 Europa offers players two variety of blackjack games. They have classic blackjack game and also blackjack switch. When I play online blackjack I like to play blackjack switch as you can’t count cards at an online casino anyway and the game is a bit more fun then the usual classic blackjack that you find at most online casinos.